The latest version of Google’s mobile operating system, Android 6.0 Marshmallow, is slowly beginning the rollout to the most important handsets on the market, even though it’s been some time since it’s been announced. Of course, everybody was interested when one of the best phones launched this year, the Samsung Galaxy S6, will get it. Considering that there were a lot of rumors about the dates when the South Korean manufacturer’s top handsets will receive the update, every leaked image is great news for Samsung fans. Brace yourselves, a flat TouchWiz is coming! 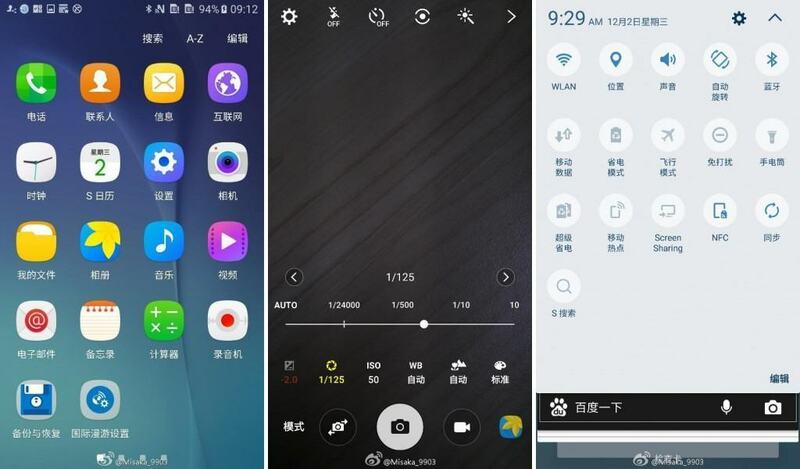 Well, if you’re a Galaxy S6 user you have all the reasons to be happy, as according to International Business Times, a new set of leaked screenshots with the handset running Android 6.0 Marshmallow was spotted on Chinese website Weibo. The images reveal some pretty interesting details, like the new flat design and key features, brought by the new OS. The update brings a pull-down status shutter, used to gain access to settings and notifications, with a white background and blue text. Samsung’s TouchWiz is more closer Google’s Material design now, introduced alongside Android 5.0 Lollipop. For those who aren’t looking for a design as close to stock Android as possible, the new look isn’t that special, but wait, there’s more. Android 6.0 Marshmallow will also bring a “Pro” mode for the camera, seen on the Galaxy Note 5 and enabling users to control features like shutter speed, exposure, white balance and ISO, alongside multiple manual settings. As for the rollout date for the Samsung Galaxy S6, we must admit that we don’t know nothing. Still, presuming that the Galaxy Note 5 phablet will receive the update somewhere in December, the OTA for the S6 should arrive in January 2016. When do you think your Galaxy S6 will receive the Android 6.0 Marshmallow update?